The Sicilian sun is very hot. Or, perhaps it is the combination of the sun and the dry winds that blow in from Africa. Sicily is located at the tip of Italy’s ‘boot’ and parts of it are actually geographically closer to Tunisia than Rome. I knew this before I went there, but only when I dug into a plate of cuscus al pesce, fish couscous, and drove around the island of Pantelleria, with its Arabic gardens, did it really hit home. Sicily is a delight to the senses from every possible angle. Over its long history, it has been home to great Greek and Roman empires, as well as an African trade route. 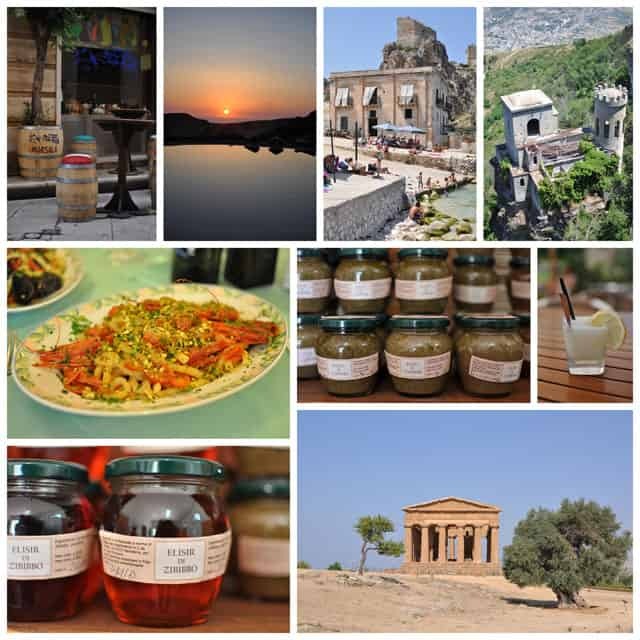 Signs of this history is scattered throughout the island in the form of magnificent ruins, as well as in the spices and grains that still play a predominant role in Sicilians’ diets. Over the two weeks that we spent there, driving from city to Baroque town, on occasional dirt roads, and straight to the southernmost tip where the sea met the land in a dramatic, almost end of the world feel, I experienced a place unlike any other I’d been to before. There was a lot of seafood to be eaten. Polpo, or octopus salad, grilled calamari, chilled mussels, busiate with shrimp and pistachios, almond gelato, hazelnut granita, couscous, and marinated sardines were all consumed. I was charmed to find that virtually every city we stopped in had its own form of pasta, or some sort of truly local ingredient. 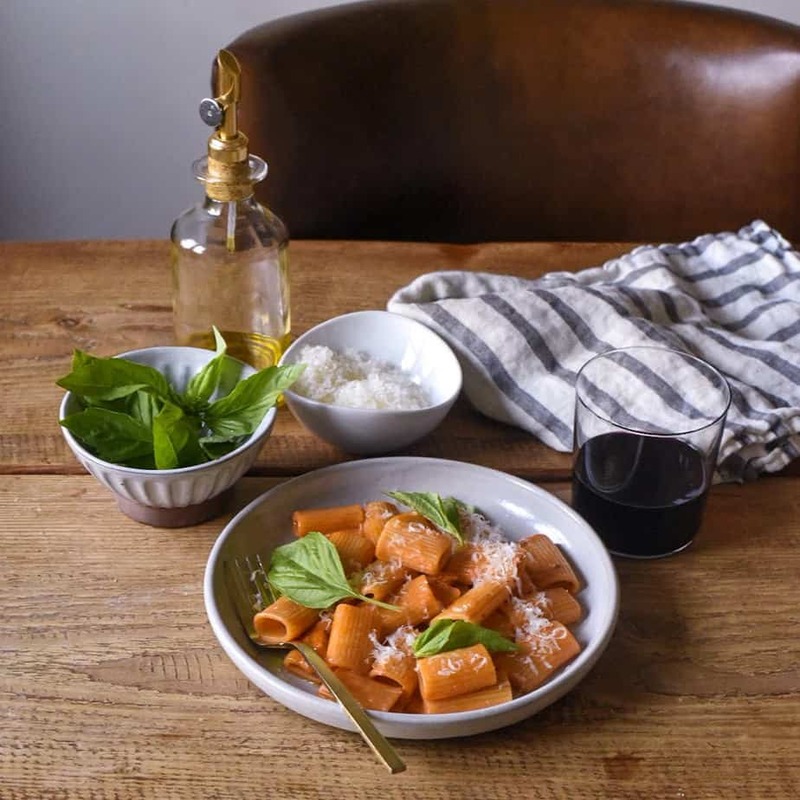 In Trapani, it was busiate (corkscrew) pasta with Trapanese pesto, one of our favorites. A sweet treat in the form of gelato or granita was on our daily agenda (sometimes twice!). And, after reading this Saveur article about the pasticcerias in Sicily, I knew we had to sample Maria Grammatico’s and Caffe Sicilia’s goods. Despite the variety, my favorite Sicilian pastry remains the cannolo, a crispy fried dough filled with a pillowy ricotta mixture, dotted with chocolate chips. In Modica, a UNESCO World Heritage Site, we sampled the town’s famous chocolates, made there since the 1800s. The nibby, crumbly texture of each bar is unique to this town’s historic recipe, which doesn’t incorporate milk but rather focuses on the bean itself. 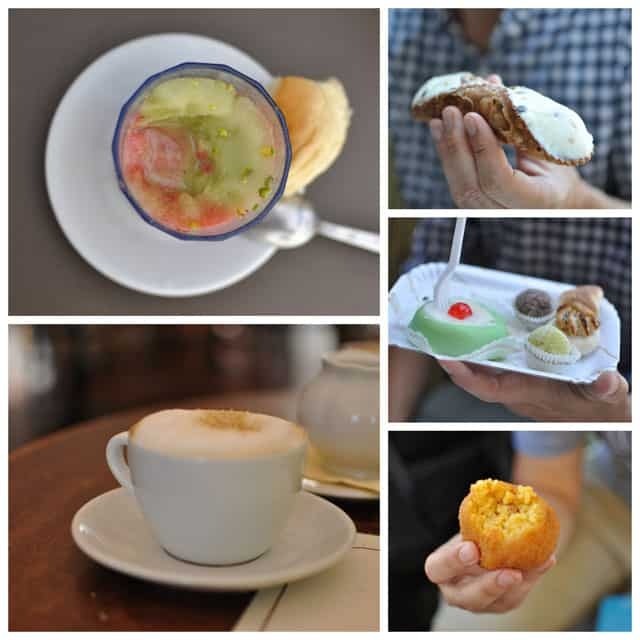 In Noto, another UNESCO World Heritage Site, we enjoyed our granitas the traditional way, with a side of brioche which is dipped into the icy, cold dessert. The brioche from Caffe Sicilia was perhaps more memorable than the granita sampler itself. We had our first, and favorite, gelato of the trip at Massaro 2 in Palermo. One cone, one brioche and two scoops of pistachio. In Sicily, virtually everything is made with or topped with pistachio nuts and who were we to complain? Caponata, the Sicilian dish I knew best prior to this trip, wasn’t like anything I’d experienced before. Every restaurant had a different approach to one of my favorite vegetables, the eggplant. Some caponatas were more chunky, some more sweet, some with a more pronounced taste of olives. In each instance, I finished every last bite. On days when we just couldn’t bear to eat another huge meal in the hot afternoon sun (or simply arrived at our new destination just in time for siesta) we sampled paninis from the local grocery stores and delis. Each one was made fresh: the tomatoes were sliced before us, the buffalo mozzarella was taken out of its watery bath, and everything was generously sprinkled with dried Sicilian oregano. Each meal, whether fancy or casual, offered something memorable. In Marsala, where we ate while being engrossed in the Eurocup Final (which, sadly, Italy lost), we proclaimed to have had the best pizza. With a blistery crust that was thin as paper, the pizza we had at Divino Rosso is one I’ll be dreaming of for years to come. 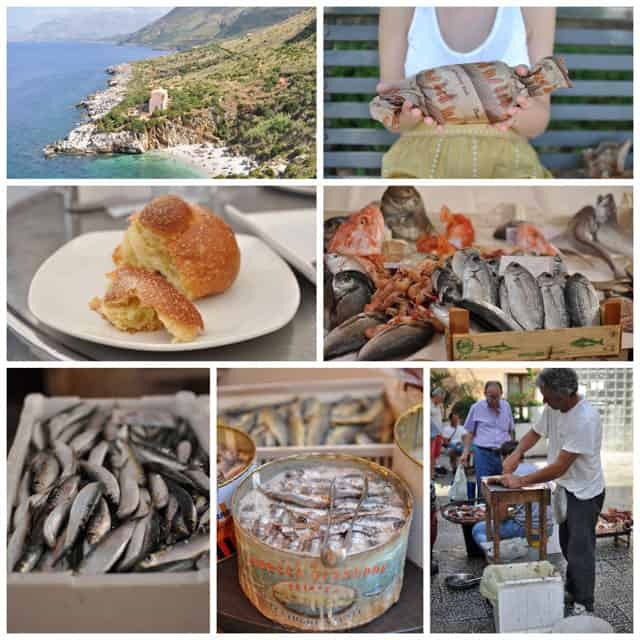 But, beyond the food, there is much to be said about the culture, nature, and people of Sicily. From the man at the market who shooed us away when we tried to pay for a bag of tomatoes to the absolutely stunning nature reserve at Zingaro, the places and ways of this island are something truly special. Thanks to Matt’s foresight, we brought our GPS to help us navigate and, despite a few minor snafus, it truly helped us circumvent the island and reach some amazing places. I mention the Zingaro nature reserve as it, along with a tuna fishery in nearby Scopello, were hands down our favorite places to swim and relax. With little hikes that take you down to the water’s edge, white pebbled shores, and the clearest and calmest turquoise water, it was hard to motivate to go anywhere else. 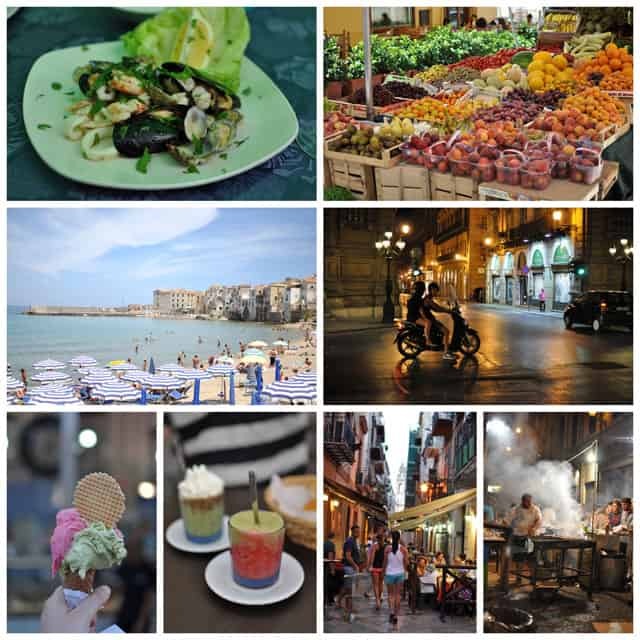 Among the larger cities we visited, we agreed that Trapani had the best and most unique food, Siracusa the most charm, and Palermo the most big city umph. 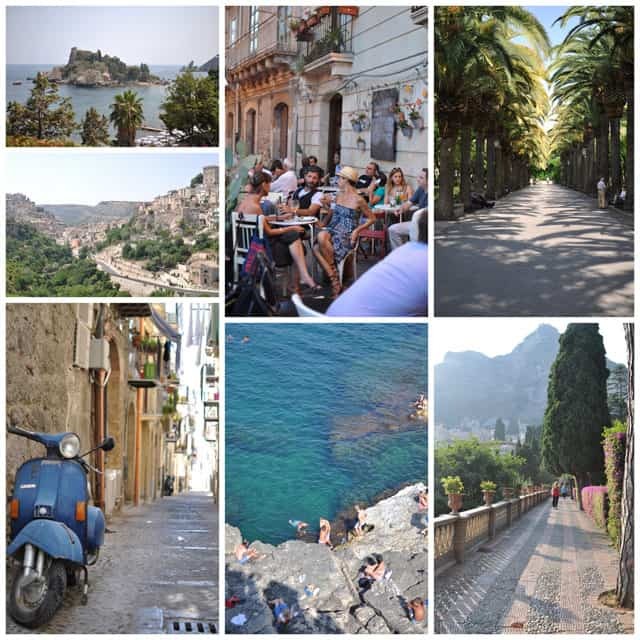 Taormina, crowded and touristy as it was, was a magical place with many gorgeous sites (including a can’t-miss botanical garden and the best stop for the creamiest granitas). The Baroque towns of Noto, Ragusa and Modica were small enough to conquer in one day but left an impression that lasts much longer. The best way to enjoy them? To just linger. Erice, a hilltop, walled town that sits high above Trapani, was another location that simply took my breath away and brought me back to my days in Siena. Perhaps one of the most enjoyable parts of the trip for us was being able to experience the local culture, which very much revolves around the land and the sea. 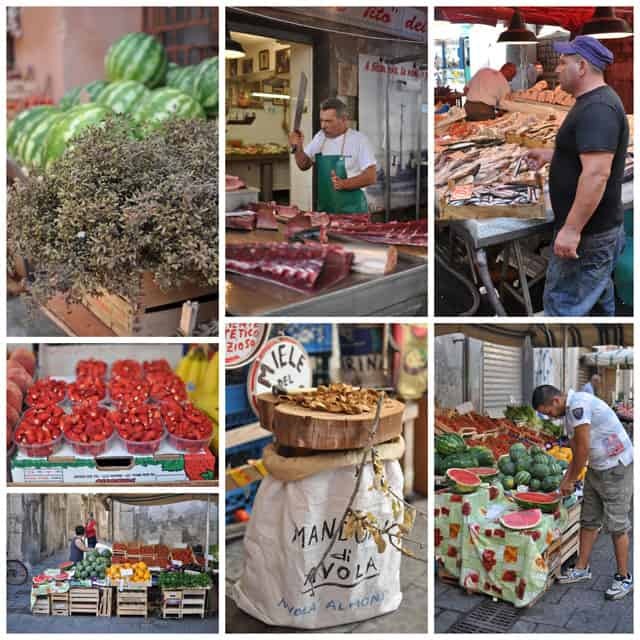 In many of the towns and cities we stopped in, we tried to make a point of exploring the local market. The seafood selection, the fishermen hawking their wares, and the interaction between sellers and the local community were all a site to behold. We purchased some tiny local fragole (strawberries), grapes, figs, tomatoes, and nuts. We wished we had an opportunity to try cooking some of that glorious seafood at home! We returned with a large supply of chocolate, local honeys, salt-packed capers from Pantelleria (an island off the coast that we visited for a friend’s wedding), caper spread, Passito desert wine (a local specialty of Pantelleria), and a bottle of wine from Mount Etna. I assure you we will be working our way through our tasty treats very, very slowly. 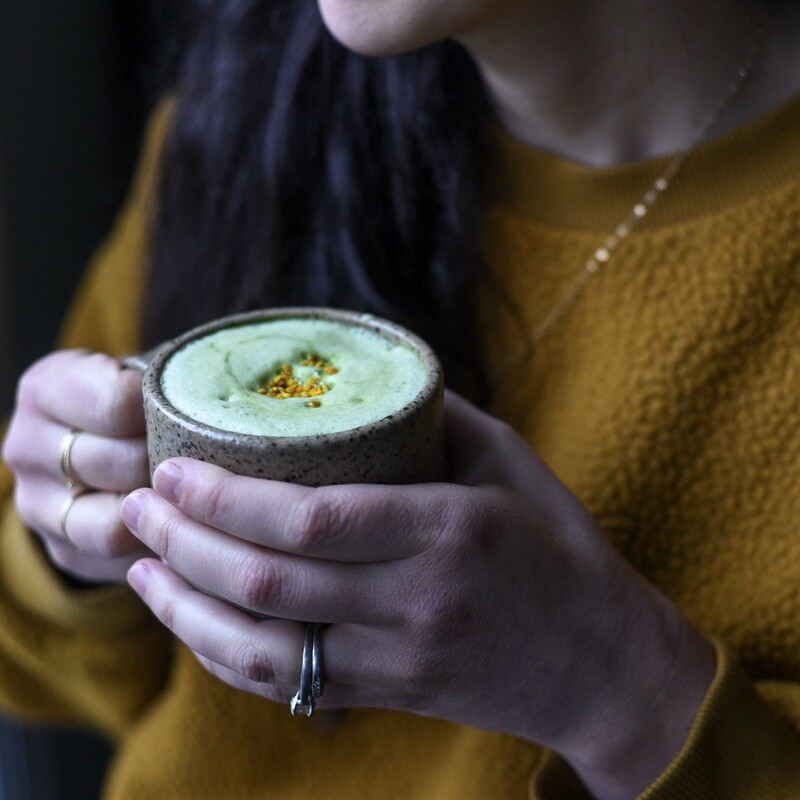 Below, I’ve included some recommendations for some of the tastiest places we ate, our favorite places where we stayed, and some must-try foods. 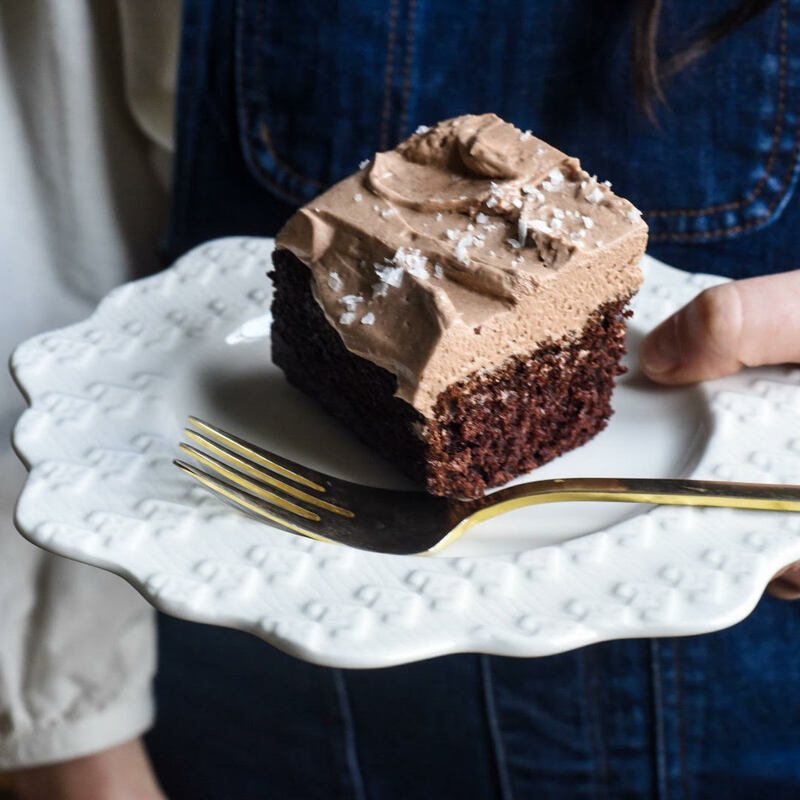 In the coming months, I’m sure you’ll be seeing recipes inspired by our time there.